RulesFest is a blog where we go over a few of our design choices as well as cover the occasionally missed rule. This week we talk about the exciting world of Chasers, the scariest drinks at the Red Dragon Inn. 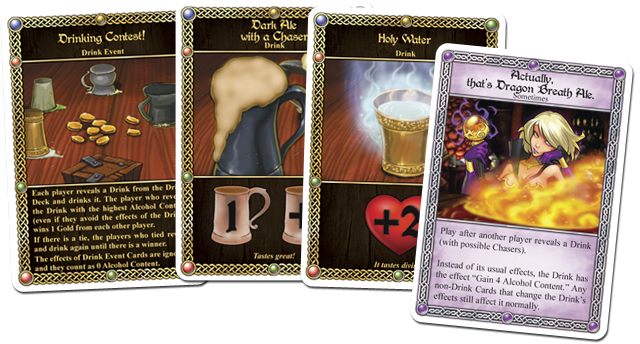 The drinks of the Red Dragon Inn are arguably the main attraction for adventurers far and wide. 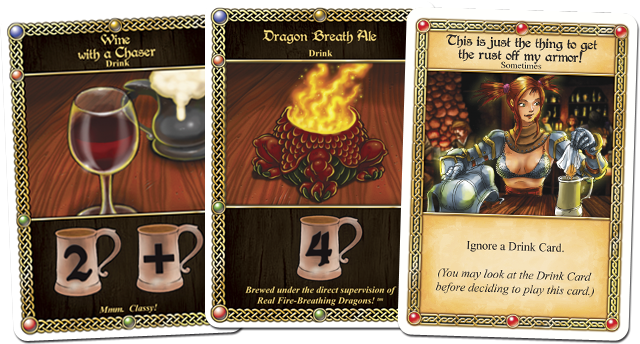 While the fiery Dragon Breath Ale or disgusting Ogre Brew are likely to turn heads (as well as stomachs! ), when these drinks are combined with other more run-of-the-mill refreshments you’ll see adventurers dropping like flies. Today we are focusing on the dreaded Chaser, what they do and how to get out of drinking them! 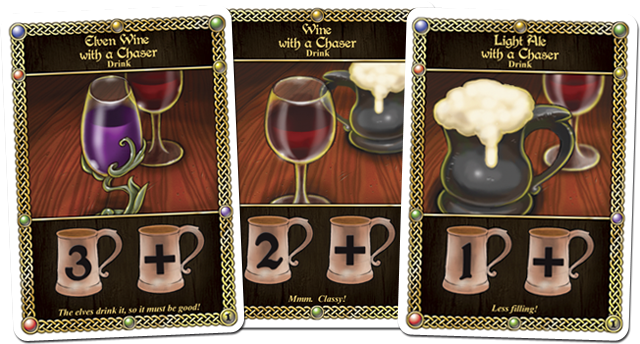 Every Drink Deck has a variety of Chasers in it, usually made of the more “normal” drinks. While these drinks on their own aren’t too exciting, the simple fact that they combine with other drinks makes them very formidable. To start things off, a quick refresher on the Chaser rules. To the right is the Chaser icon. Whenever a player reveals a Drink Card with this icon, they must reveal another Drink Card and combine its effects with the previous card, making one super hybrid drink! Where do these extra Drink cards come from? If the first Drink Card came from your Drink Me! Pile, then any other Drink Cards you must reveal come from your Drink Me! Pile. If you run out of cards in your Drink Me! Pile then you stop and do not add any more cards to this drink. If the first Drink Card came from the Drink Deck, then any other Drink Cards you must reveal come from the Drink Deck. Because the Drink Deck never runs out of cards (you just reshuffle it), you always have to reveal another Drink Card. What happens if I reveal another Chaser? Usually Chasers tell you to reveal only one extra Drink Card. The only time you reveal more Drink Cards is when your extra drink is also a Chaser. That’s right, Chasers can chain into more Chasers! In the below example, some poor adventurer has to deal with a 9 Alcohol Content drink! What happens if I reveal a Drink Event? If you ever reveal a Drink Event while resolving the ability of a Chaser, you stop immediately, discard the Drink Event, and move on to responding to the drink. How do cards that respond to drinks work with Chasers? Chaser Example 1: Fiona drinks from her Drink Me! Pile and gets Wine with a Chaser. She reveals the next card on her Drink Me! Pile and gets Dragon Breath Ale. She adds the effects of both Drinks, for a total Alcohol Content of 6. Fiona plays “This is just the thing to get the rust off my armor!” to Ignore the Drink, so she gains no Alcohol Content. 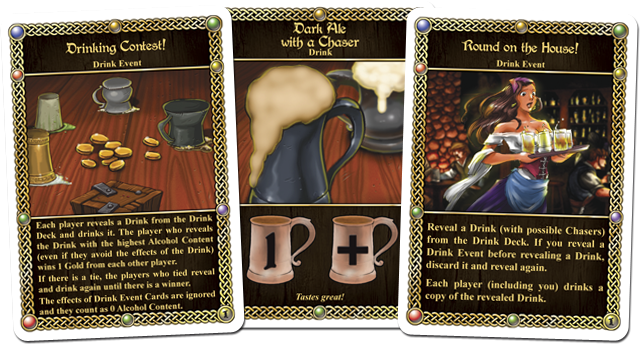 Chaser Example 2: During a Drinking Contest, Deirdre reveals Dark Ale with a Chaser from the top of the Drink Deck. She reveals the next card from the Drink Deck and gets Round on the House. Since Round on the House is a Drink Event Card, it has no effect as a Chaser. Deirdre gains 1 Alcohol Content. 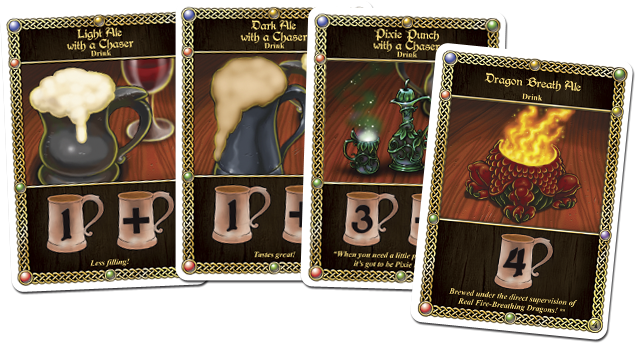 Chaser Example 3: During a Drinking Contest, Fleck reveals Dark Ale with a Chaser from the top of the Drink Deck. He then reveals the next card from the Drink Deck and gets Holy Water. In response, Eve plays “Actually, that’s Dragon Breath Ale” turning Fleck’s Dark Ale with a Chaser of Holy Water into a Dragon Breath Ale! Whew, that was a long drink! Hopefully we’ve been able to dispel any confusion players had about Chasers and how they work in RDI. Now if you don’t mind, we’ve got some drinks waiting for us at the bar. See you next time!